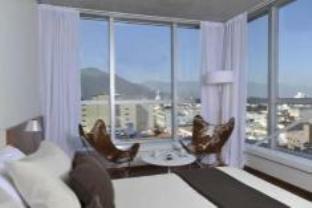 Have a question for Design Suites Salta Hotel? 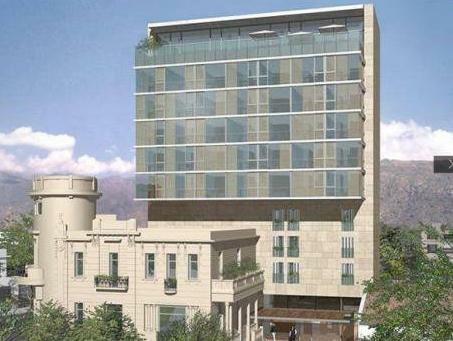 If what you're looking for is a conveniently located hotel in Salta, look no further than Design Suites Salta Hotel. From here, guests can enjoy easy access to all that the lively city has to offer. For sightseeing options and local attractions, one need not look far as the hotel enjoys close proximity to Iglesia Catedral, Catedral, and Museo de Bellas Artes. Offering hotel guests superior services and a broad range of amenities, Design Suites Salta Hotel is committed to ensuring that your stay is as comfortable as possible. Top features of the hotel includes a restaurant, meeting facilities, Wi-Fi in public areas, room service, and an elevator. Hotel accommodations have been carefully appointed to the highest degree of comfort and convenience with a mini bar, air conditioning, internet access, and a separate shower and tub in each room. The hotel's massage treatments, Jacuzzi, outdoor pool, fitness center, and spa are ideal places to relax and unwind after a busy day. Whatever your purpose of visit, Design Suites Salta Hotel is an excellent choice for your stay in Salta. Guests 0-3 year(s) stay for free. Note, there is no additional charge for a cot. Guests 4-12 year(s) are considered as children. To request an extra bed for a child, please contact hotel directly. Had a great shower, nice breakfast. The hotel is located in the city centre, so you can easily walk to and from the hotel. Rooms are beautifull as long as you love modern furnishment. Staf is very helpfull and speak English! Great stay at the Design Suites Salta. Have to add that we booked this hotel with our Agoda award points. We would not have booked it if we had to pay the full amount. Design Suites Salta is a very new hotel and there are still some teeting problems with its running. The location is superb - it is a 5 minute walk fromthe central square of Salta, which is perhaps the best such square in Argentina. The rooms all face east over a small square in front of the hotel. The architects have used a combination of polished concrete and wood to create a minimalist and very modern look. In some ways this is out of tune with Salta as a whole which has several architectural gems over 50 years old. Quisieron cobrarme el 21 % de IVA al llegar al hotel y en el check out, IVA que ya habia sido pagado al momento de la reservación por Agoda. Aun figurando en el mail de la reserva enviado por Agoda el desglose del precio y figurando que ese 21 % era en concepto de tasas y era un importe que Agoda pagaba al hotel, seguian insistiendo en que debia pagarlo alli sin explicacion alguna de por que o de que era entonces ese cargo en la factura. Malisimo. Teniendo en cuenta que querian hacerme pagar el 21 % de IVA 2 veces, era un delirio el precio de la estadia. Por el momento, lo unico que espero es que no lo carguen de prepo en mi tarjeta de credito. Solo como sugerencia seria buenisimo que la pileta tenga una cobertura corrediza para los dias en que el clima no te permite usarla! Hotel moderno, muy lindo y super bien ubicado. La limpieza y el personal excelentes, solo deben mejorar el desayuno, muy conservador, todos los días iguales, café quemado, y muy acotado en variedad. Es uno de los mejores hoteles que he estado en el Norte del pais. Bien que bien placé, impossible d'ouvrir la fenetre le soir à cause des bruits des gens ds la place ou des voitures qui passent. Si l'air conditionné n'est pas allumé, la structure de métal et verres, grince tout le temps. Dans ma chambre l'air ne fonctionnait pas bien et le technitien m'a dit que le moteur était un peu vieux, donc impossible d'avoir un température égale dans toute la chambre. Impossible de passer au mode " ventilation": c'est de la reception qu'ils pouvaient le faire, mais alors je ne pouvait pas retourner l'appareil au froid/ chaud. En plus l'appareil est assez brouillant et pour modifier la température il faut se lever, car les boutons sont au mur, pas de contrôle. Des traces d'humidité et filtrations dans la chambre et dans la salle de bain. Le frigo perdait de l'eau. Dans la salle de bain le robinet pour passer l'eau à la douche marchait mal, donc l'eau sortait en bas et en haut. Il me semble que ces inconvenients ne correspondent à un hôtel 4 étoiles. das hotel ist zentral gelegen. die zimmer sind geräumig und modern eingerichtet. das frühstückbuffet ist abwechslungsreich. parkmöglichkeiten sind in der näheren umgebung vorhanden (kostenpflichtig). die dachterrasse ist mit einem jacuzzi und einem kleinen swimmingpool ausgestattet. Het was mijn verjaardag en de receptie kwam een flesje bubbels en chocolaatjes op onze kamer brengen, van t huis. Receptie is erg vriendelijk, je kan in de lounge blijven na het uitchecken en we werden geholpen met restaurants en een andere slaapplek. Het ontbijt was simpel en het zwembad wat verouderd. Solo como sugerencia seria bueno que la pileta tenga una cobertura corrediza para los dias mas frios! Ett bra hotell som ligger några kvarter från torget och gågatorna i Salta. En mycket bra frukost i en trevlig matsal. Rummet var stort och luftigt. Pool på taket med några få solstolar. Extra handdukar på vägen ut till poolen. Även en jacuzzi fanns men där såg inte vattnet så trevligt ut. Jag ar valdigt nojd med allt pa detta hotell, personalen var valdigt hjalpsam, rummen riktigt snygga med en fantastisk utsikt. Kaffet var inte jatte gott men det har jag i och for sig upplevt pa manga stallen i detta land.